It’s not that I don’t love you — I do, honest I do — it’s just that since moving house and having a baby I seem to find it impossible to actually locate things I’ve made, photograph them and then remember which SD card they’re on. Such simple tasks in theory, and yet I fail consistently. This is not helped by the fact that my brain likes things filed neatly, and so even if I locate a few items on a memory card, they get rejected for not being the thing I made after the last thing I blogged about. Anyway, I’m just going to have to let it go and show you what craft-related items I have on my laptop right now (oh, and the death of a laptop has not been helpful in my quest to locate and file). 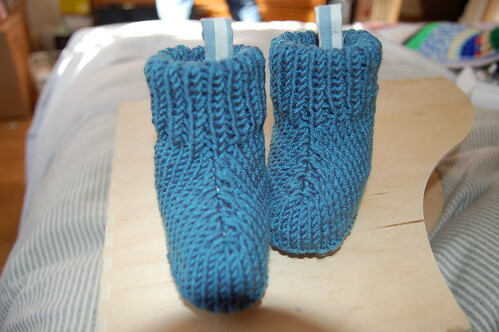 OK, after a long search, I’ve found… some baby booties. Anyway, I made these ages ago (last summer) from a lovely Japanese pattern book. They were extremely quick and easy. The downside being that Cecily left them on her feet for about 20 seconds before pulling them off. 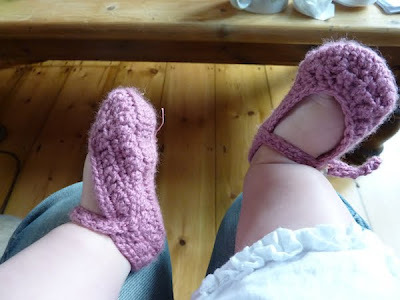 After that, I actually altered the pattern and added a little extra row which made them less inclined to give into the merest tug from a curious infant. Unfortunately, this meant that they stayed on for a lot longer until Cecily decided enough was enough and ripped the entire strap off. After that, I put them in my craft bag where they make me smile and where a baby can’t seek and destroy. Look at her ickle chubby feet! Well, I say “recently” but given the parlous state of this blog, what I actually mean is “in the really quite considerable amount of time since I last blogged”. I’m going to whip through them all, keeping my usual hilarious commentary to a minimum as I don’t have as much time to play with these days. For her friend, baby Noah, born 2 weeks after her. 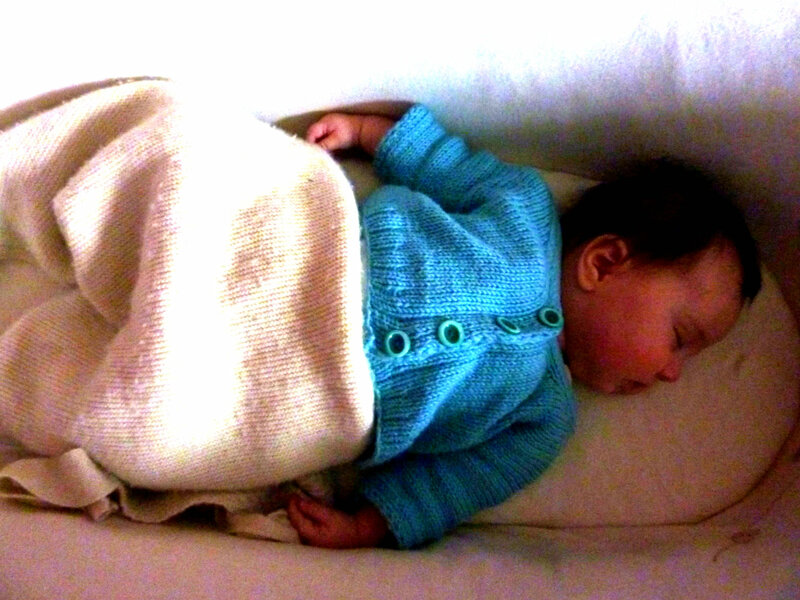 The eagle-eyed amongst you will have spotted that I’ve been knitting again (shocking, I know). 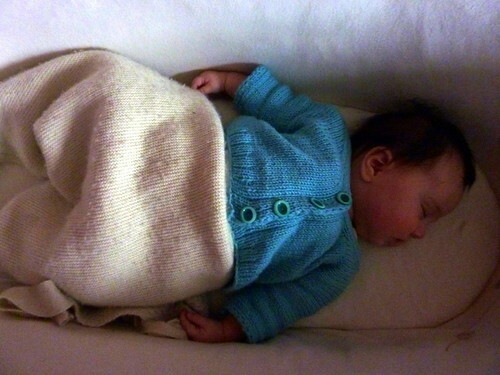 All patterns are from the Erika Knight Natural Nursery Knits book. So, not only have I been busy knitting, growing a human from scratch and packing up to move house, I’ve also been working away at a brand new pet project: Dork Adore. It’s basically a geek haven, designed to have a category for nearly every area of the internet that dorks adore. And, of course, it goes without saying that there’s a craft section. I’m very proud of my new site, and I’m also blown away by the number of lovely writers who have given their time to what is basically a labour of love. Lots of ex-Shiny writers are on board, including Susi Weaser (my successor as editor of Shiny Shiny), Gemma Cartwright, Robyn Wilder and Anna Waits. I’ve also had world-famous children’s author, Alex Milway (he’s my husband, I’m allowed to be biased. Buy his books!) and Gemma’s other half, Charles, who has written a hotly debated piece about Twilight and how rubbish it is. And last but by no means least, my wondrous editorial assistant who works for my company, Miramus – Emma Cossey. Anyway, have a look at the site, and let me know what you think. And if you’re a crafty person and have any tips (or want to write!) you can get in touch over on Dork Adore. 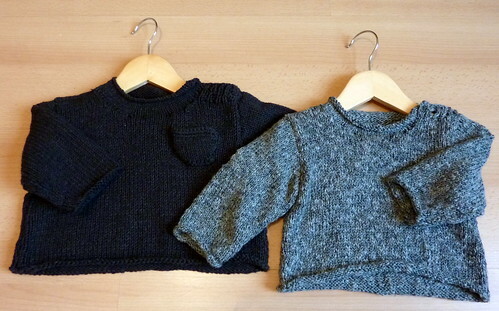 Brace yourselves, people, I’ve been… KNITTING! It’s outrageous, I know. I’m basically a traitor to the crochet community. 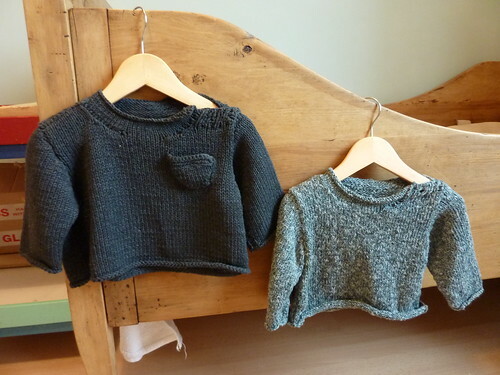 But the fact is, I got myself knocked up (intentionally, I should probably add), and I started making a few crochet things, but soon even I had to accept that knitting has the edge over crochet when it comes to clothes. 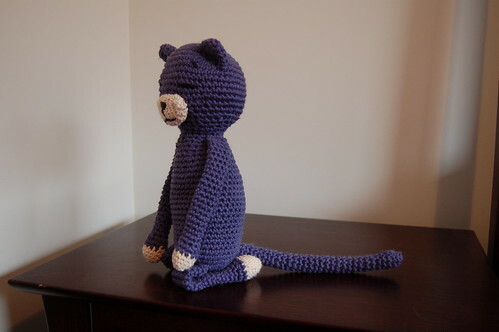 But knitted toys still aren’t as good as crochet ones. Which is probably why the “knitted character” on Harry Hill’s TV Burp is clearly crocheted and should be renamed immediately. Anyway, that was an unplanned side-rant and I should probably move on before I start getting foam bubbles round my mouth. So, here’s something I still haven’t finished crocheting. 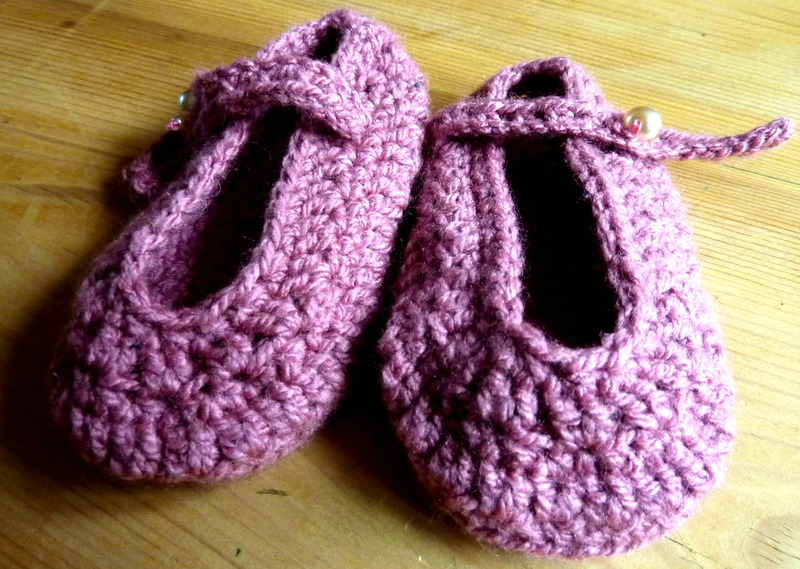 And here’s the same thing, made by my crochet-whizz of a mother. 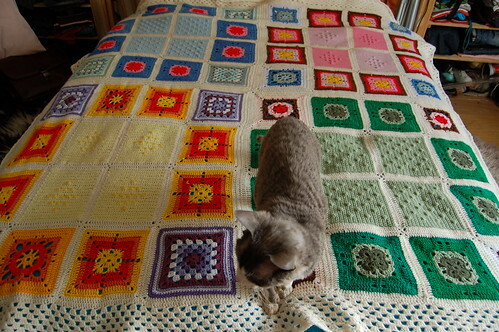 And this is the point that I got bored of crocheting trebles round and round and picked up the needles. As you can see, my first attempt at knitting is a little bit iffy. There are clearly some errors in there. However, it turns out that one of the things that has always bored me about knitting was the simple fact that I always knitted scarves because I didn’t know how to make anything else. And knitting up and down is as dull as crocheting trebles round and round. But once I’d actually decided to work out a pattern, it turned out to be surprisingly fun. 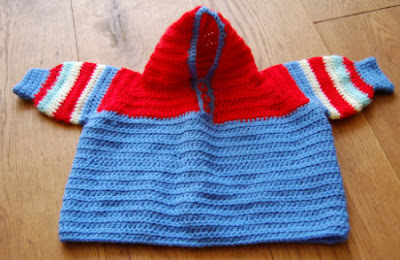 And now I know how to pick up a stitch (why did no one tell me it was so easy – I used to unpick it all!) 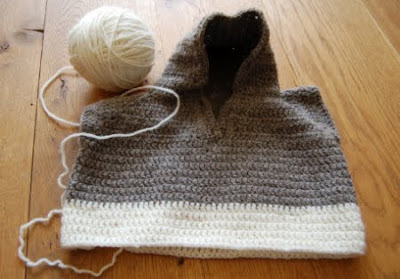 and do some basic stuff, I’m 2 jumpers, a cardie, and a nearly-finished cardie the richer. I’ll upload proper photos once I locate the memory card I took them on. 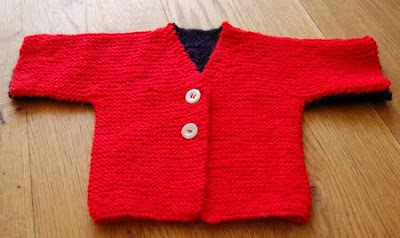 But rest assured they’re a lot less dodgy than my first cardie. 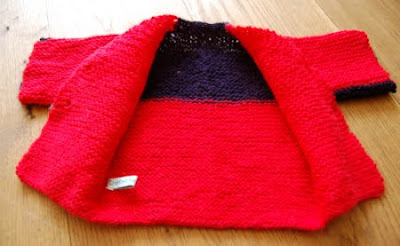 Plus, I actually made sure I had enough wool to finish the pattern – unlike this red one with the dash of “oh crap I’ve run out of wool, this will have to do” blue. I’m Alpaca Girl’s Fiber Arts Friday featured blogger! The lovely Katy from Alpaca Farm Girl contacted me to ask if I’d talk about the fine art of crochet for her Fiber Arts Friday feature. How could I refuse? I am but flesh and blood. You can read my hilarious insights and homespun wisdom right here. Also, I know it’s shameful of me, but I gave Katy the scoop on two things I finished making recently: my crochet blanket (well I say “finished” – I’ve still got a row of edging to do) and my amigurumi Milo, which I made for my Milo-mad niece over in Australia. She’s already picked a hole in the back of his neck, which I think speaks volumes about the ingratitude of 2 year olds.